November, 1978 - WXLO's Charlie Steiner is sitting down to his fourth newscast of the morning. The studio is exceptionally neat, but only slightly larger than most people's closets. 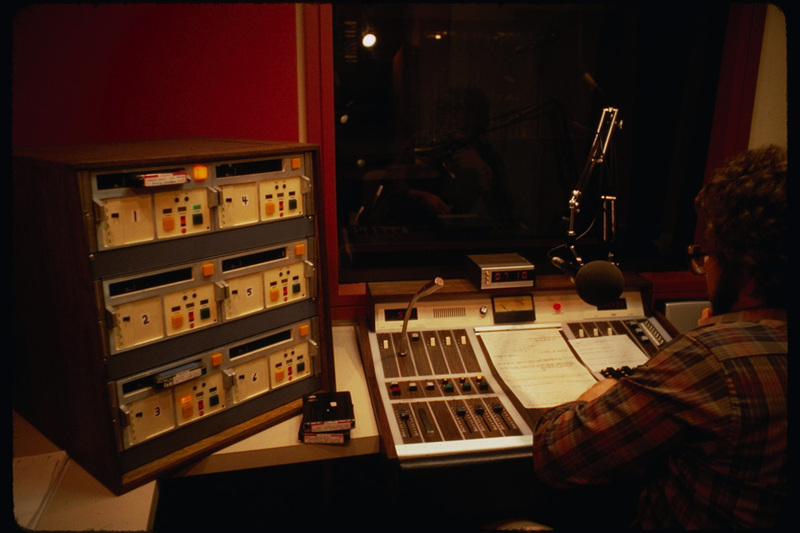 While at some other stations the news anchor sits across a table, where he can see the jock/engineer, at 99x, the news person is in a separate studio. He can see neither the jock, nor the producer/engineer. "This song's a quiet one," comes the voice of a technician, from a console located two rooms away, "so come out softly." Now on the air, Steiner puts the finishing touches on his copy, as he chuckles to the sometimes stale one-liners dished out by morning jock Jay Thomas. "Some happy birthdays this morning..." Thomas starts a representative exchange. "When you were a kid, did you watch Father Knows Best?" Thomas queries, gliding into what is supposed to be the 7:50 AM news. 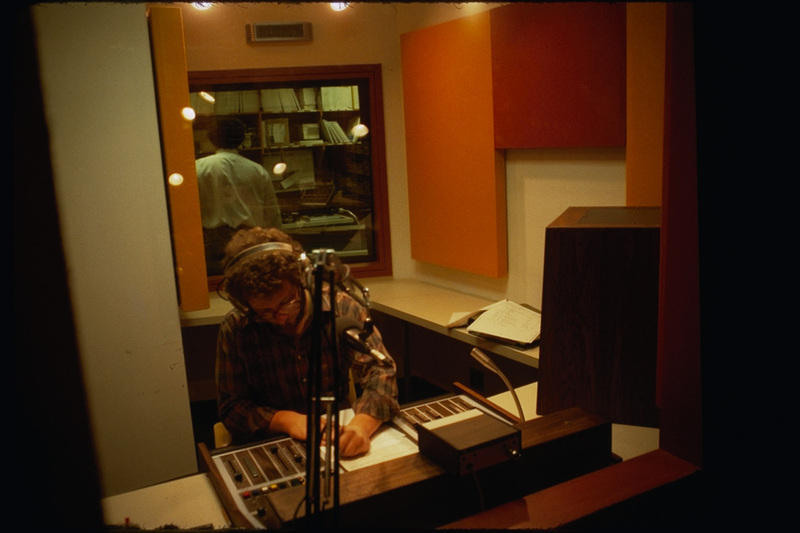 Hear how WXLO 99x sounds in 1978, plus an interview with News Director Charlie Steiner. THOMAS: Well, then later this lady appeared in Lost In Space. It's her birthday today, who is it? STEINER: Who is it?? I don't know. STEINER: You're going to embarrass the hell out of me is what you're going to do. THOMAS: Angela Cartwright, twenty-six years old. STEINER: She's 26- Oh, I bet she's nice now. THOMAS: She was kinda chubby, remember?? "Wait a minute," Thomas breaks in. "I made a mistake. It wasn't Father Knows Best, it was the Danny Thomas Show!" Thomas is orchestrating what sounds like a small-scale carnival. It is some time before Steiner can give the time and temperature again. Then, going into a brief weather forecast, he proceeds onto traffic conditions, and the news. Living in a city where a fatal mugging is not considered a big story, Steiner chooses to employ a fatal traffic accident as a neat segue between the traffic and the news. With twelve years of working experience in broadcasting behind him, having reported at all-news stations in Hartford and Cleveland, Charlie Steiner came to the conclusion some time back that top-40 audiences enjoy a colorful approach to news. "We're not a hard news department, with five minutes of death, destruction, and politicians flapping their jowls," he says. "If we're gonna cover a fire, the angle we're gonna take is twofold: One, how it affects the people involved in the fire, the chronicling of human events, human emotion. Secondly, how that fire may have had an effect on traffic. How that's gonna screw up somebody's ride home, which is all the guy who's stuck in the car in the middle of a traffic jam is concerned about... 'Well, it's too bad there was a fire, and it's too bad they've lost property...' Ultimately, the guy who's driving in the car wants to know when he's gonna get out of the traffic jam." Instead of fifty minutes of music, and five minutes of news," Steiner prefers to think a station can have "an hour of programming." 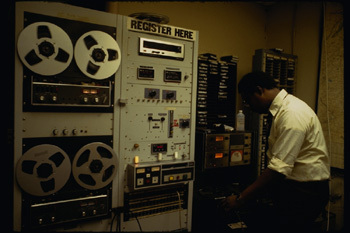 Reporter Bob Slade prepares a feature tape about discos in New York. "We try and tie in the news, in terms of flow, its style, its substance, with what the rest of the hour is doing. I never expected our news would be a 'tune-in'," he admits," but if we can keep it from being a 'tune out,' we've already accomplished our goal. We try to make that five minutes per half hour as part of the program -- part of the entire hour." 99x's news department accomplishes that mission largely by looking for ways to enter and exit a newscast smoothly. Steiner works for a station that appreciates slick, tight transitions from one form of program, to another. So morning newscasts usually include a dialogue with the disc jockey. If there is a feature tacked onto the end of a newscast, someone will invariably find a record to match it. When the station ran a twenty part series on discos one week, the engineer evenly segued out of each newscast/disco piece with a disco record. Because WXLO is an FM stereo station, it can use deeper mixes in its produced news pieces of this type. If there is an Al Stewart interview lofted at the end of a newscast, one has a good chance of hearing it dovetailed into an Al Stewart record. Because of such mixes, listeners can never be sure when the newscast ends, and the music picks up again. Steiner concedes that once inside the newscast, 99x tends to "deal with the same basic hard-news stories that everybody else does, perhaps in a shorter, more terse way..."
He will, however, forgo extensive coverage of, say, social security benefits, in favor of stories he feels are more directly related to the 18-35 audience 99x is trying to lure in. Charlie Steiner makes last minute edits to the morning newscast in the WXLO news booth. 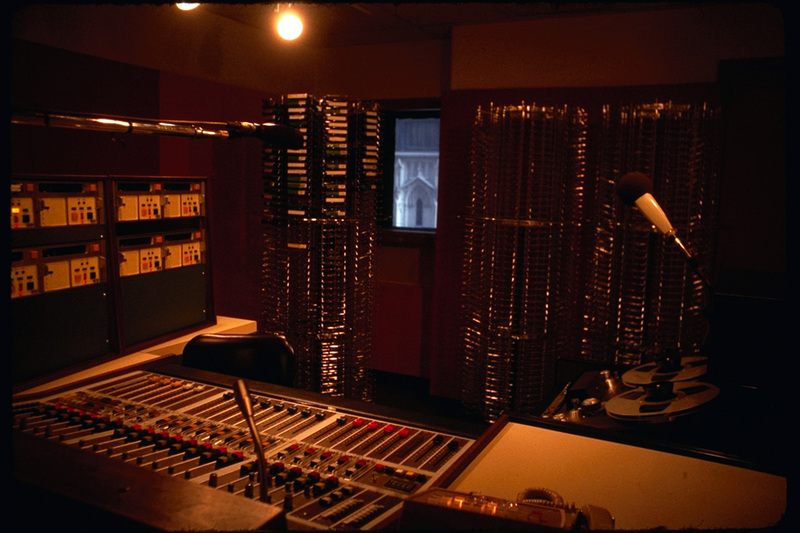 See "Inside the Sound Studio" below for notes about sound equalization in the studio. holds a universal aversion to the use of definite and indefinite articles. But Steiner contends that while these usages might cause problems elsewhere, loosely constrained diction may be an asset at a New York top-40 station. do it as informally, and as easily on the ear as you possibly can." "Within the confines of a top-40 station, which is what we are, I think it's wise to use the vernacular, the lingo, the jargon of the audience. That's how they can best relate to what you're trying to tell them about. And if it's most effective, and most comprehensive using slang or lingo, fine, go ahead and do that." that a little. There, you can use everyday talk, because that's the best way to get the story across. But I don't know if you want to go top-heavy with it. And if you're into a middle-of-the-road, well upper demographic, you might not want to do any slang at all." Being an RKO station, WXLO trades actualities (sound bites) with WOR, and any other sister station around the country. The station also utilizes the talents of WOR's weather caster. Bill Korbell, who is known to the 99x audience by name "Flash Flood." Korbell engages in a daily dialogue with 99x's morning jock "from the roof" (actually, from the 23rd floor). The exchange generally involves more idle conversation than it does weather. THOMAS: 99X, this is Jay Thomas, calling the roof of 1440 Broadway. KORBELL :And the roof is answering. . .
STEINER: Hey, flash, how are ya? THOMAS: Well. We've got Charlie Steiner in here. This is an undue pleasure. We also have the weather. Do you mind if we do the weather?? KORBELL: Yeah, I'm supposed to do the weather. STEINER: Both of you, hold on a minute. Flash, between you and me, I got something to tell ya. KORBELL: Okay, tell me off the air. I have a feeling it's not something I want anyone else to hear. STEINER: You have some new competition I see. A new weather lady is coming on T.V. tonight. THOMAS: Now Steiner, you're gonna start something personal here that you shouldn't be starting. STEINER: Wait a minute ... what personal?? I was gonna ask him. I see that Tex Antoine got dumped for the ump-teenth time, and I'm just wondering what you know about Linda Caroll. Apparently, Jay knows quite a bit about her. 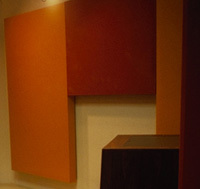 The sound absorbers seen on the wall's of WXLO's studios are there for a purpose. Small studios require painstaking equalization -- otherwise certain frequencies will be selectively reflected by walls and other objects. A smaller operation might simply put sound absorbers everywhere in the room -- but 99x has opted for sophisticated room equalization instead. Hear 99x engineer Barry Luckwick explain the intricacies of balancing a sound studio. STEINER: What can you tell us about Linda Caroll? THOMAS: Who, me or him ? KORBELL: I never heard of her. '. 'That does she do? THOMAS: She dumped me, that's what she did... (sfx: slide whistle). I went out with her a little bit. I hope her boyfriend's not listening. But we went out a couple of times, and she's an actress, but I had no idea she was a meteorologist. THOMAS: She told me she didn't like me. That's how (sfx; slide whistle) Will you stop with tha-- You know that good and well Steiner. Now, you see. I'm getting tears in my eyes. THOMAS: This happens to be a good picture of her. This happens to be a good picture of her here in the paper... Go ahead, I'm sorry. For less involved accounts of the weather, 99x listeners generally depend on brief forecasts provided at the top of the news. "We open the newscasts," says Steiner, "by providing the temperature, the time, the weather conditions of the day, and the temperature we've going to have for a high." "Your most basic information in the morning is the weather, then the traffic, then the news, and then the sports. In that order. When you get outta bed, you want to know 'what the hell are you going to wear when you go into work for the morning?'" Through all of this, Steiner makes no pretenses of running a large hard-driving news operation. "There are two all-news stations in New York," he points out. "Five or six stations with huge departments." With a news force of five people, one of them a part-timer, WXLO focuses instead on integrating news into overall station entertainment programming. WXLO Picture Gallery - Photographs from WXLO, Fall 1978. WXLO Sample Formats - Newscast formats from a selected Fall, 1978 morning. WXLO News Schedules - Schedules from a typical Fall, 1978 morning. WXLO On-air Transcripts - Transcripts of sample on-air broadcasts. WXLO Datasheet - Station stats on staffing, wires, cart machines, and much more! This research documentary is Copyright 1979, 2002 Martin Hardee - All Rights Reserved. (read more...) Material may be quoted or excerpted for non-profit research purposes without additional special permission. For additional information email martin @ hardee.net.